U.S. 13 Business loops westward from U.S. 13 (Sussex Highway) through the town of Bridgeville along Main Street. The US highway runs concurrently with Delaware 404 Business from Sussex Highway north to Market Street in the Bridgeville historic district. U.S. 13 bypassed Bridgeville by 1952, with U.S. 13 Alternate established along the former alignment by 1957. This changed on November 6, 1970, when AASHTO approved the redesignation of U.S. 13 Alternate as U.S. 13 Business. U.S. 13 Business overlapped with SR 404 between the south end at Seashore Highway (SR 404 east) and Market Street (SR 404 west) in Bridgeville until 1990. Designated around that time was a new alignment taking SR 404 north along side U.S. 13 (Sussex Highway) to Newton Road west. 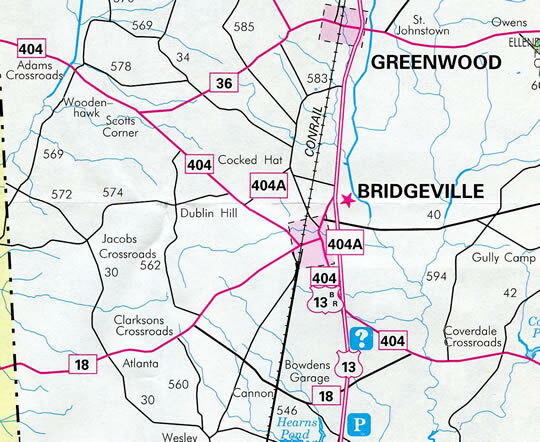 The original SR 404 mainline through Bridgeville then became SR 404 Business. Subsequent work in 2008 realigned the intersection between U.S. 13 Business, U.S. 13 (Sussex Highway) and Delaware 404 (Seashore Highway) to eliminate the acute angle taken by Main Street. U.S. 13 Business branches southwest from U.S. 13 & SR 404 (Sussex Highway) a mile north of the Bridgeville town center. Federalsburg, Maryland is referenced at 11 miles out via U.S. 13 Business south, SR 404 Business west and Road 17 to SR 18. Photo taken 01/15/17. Passing by the first reassurance marker, U.S. 13 Business south remains rural on the north approach to Bridgeville. Photo taken 01/15/17. Redden Road intersects Main Street from the east as U.S. 13 Business enters the Bridgeville town limits. Photo taken 01/15/17. U.S. 13 Business (Main Street) south crosses Bridgeville Branch and enters the Bridgeville historic district. Delaware 404 Business merges with the route south from Market Street. Photo taken 01/15/17. Drivers taking Market Street west travel five blocks west to cross the Norfolk Southern Railroad before splitting onto SR 404 Business (Seashore Highway) west and Federalsburg Road south. Photo taken 01/15/17. SR 404 Business overlaps with U.S. 13 Business south for 1.6 miles. This shield assembly remains from when SR 404 still traveled through Bridgeville. Photo taken 01/15/17. Leaving the Bridgeville street grid, U.S. 13 Business & SR 404 Business (Main Street) enter a rural swath between Antique Alley and Rifle Range Road. Photo taken 01/15/17. Main Street originally intersected U.S. 13 (Sussex Highway) at an acute angle opposite the split of Delaware 404 east. Main Street and Seashore Highway were both realigned to meet U.S. 13 at a 90-degree intersection in 2008. Photo taken 01/15/17. Development of Heritage Shores further changed the south end of Main Street. Passwaters Farm Road loops west to the golf course community and south to U.S. 13 (Sussex Highway) from a new traffic light on U.S. 13 Business & SR 404 Business. Photo taken 01/15/17. U.S. 13 Business swings out to intersect U.S. 13 (Sussex Highway) and SR 404 (Seashore Highway) at a 90 degree angle. Although through traffic is directed to bypass Bridgeville, a guide sign still directs beach bound motorists headed to Fenwick Island to use U.S. 13 south to SR 20 or SR 24. Photo taken 01/15/17. Commercial development surrounds the southern end of the Bridgeville business loop. Little remains of the old alignment, as a Wawa gas station was directly built over it. Photo taken 01/15/17. SR 404 Business ends across from the continuation of SR 404 east along Seashore Highway to Georgetown. The initial route east from U.S. 13 was also realigned to meet Sussex Highway at a 90 degree angle. Photo taken 01/15/17. U.S. 13 travels south from Bridgeville to Seaford, Blades, Laurel and Delmar. The US highway north continues to Greenwood, Harrington, Camden and Dover. Photo taken 01/15/17. Delaware 404 (Seashore Highway) angles southeast to combine with Delaware 18 in 1.50 miles. The two overlap from there east to the county seat of Georgetown. Photo taken 01/15/17. The previous approach to U.S. 13 along U.S. 13 Business in south Bridgeville. All businesses along this stretch were demolished, along with the pavement leading to Sussex Highway. Photo taken 04/13/04. Motorists bound for Fenwick Island and other southern shore points were advised to turn southward onto U.S. 13 for either SR 20 or SR 24 east instead of remaining on SR 404 east. A new sign posted on the realignment of SR 404 Business still references Fenwick Island. Photo taken 04/13/04. Delaware 404 Business ended as Delaware 404 parted ways with U.S. 13 south for Georgetown. Photo taken 04/13/04.